QOwnNotes should use suitable (i.e. light) icons when I use a dark theme for my system. Perhaps it should provide a setting so that I can specify that I'm running a dark system theme. I don't want to use QOwnNotes' in-built dark mode, nor should I have to. My system uses a dark theme but when I run QOwnNotes the icons are dark grey which makes them hard to see due to the low contrast. Install & enable a dark system theme (I'm using Arc Dark). In "Settings" > "Interface" ensure that "Enable dark mode" is unchecked. I am sorry, there actually is no light theme. There just is the dark theme and the theme your system dictates. maybe your arc theme has troubles (there were some troubles with that theme in the past), QOwnNotes should use the icons your theme provides. 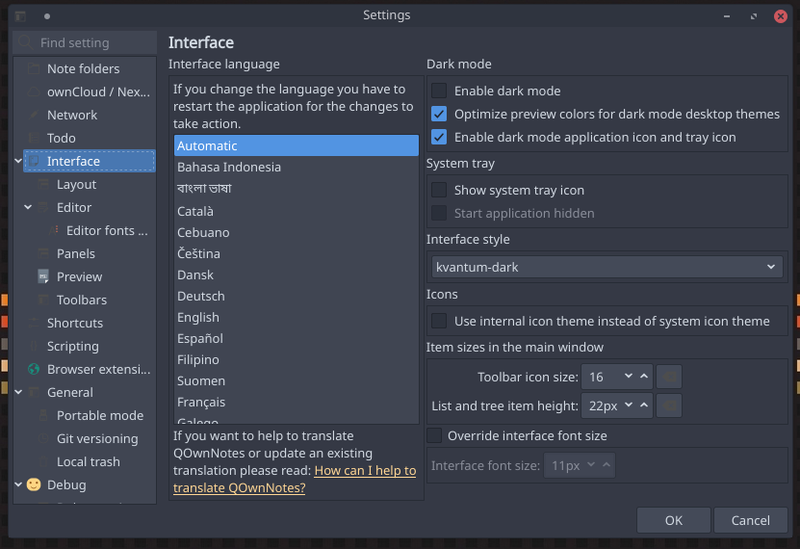 what happens if you are using for example the KDE theme breeze dark instead of arc? After a bit more digging it seems that if I switch my system icons to something other than Breeze Dark (which is what I normally use), save, then switch back to Breeze Dark and save again, QOwnNotes displays nice white icons. But this only lasts until I restart QOwnNotes, after which the app reverts back to the dark grey icons in my original screenshot. This behaviour doesn't seem to apply to just the Arc Dark theme. Breeze Dark (the theme) does the same thing (white icons persist only until the app is restarted). I should add that QOwnNotes is the only QT app on my system that behaves like this to my knowledge (Dolphin & KOrganizer for example display white icons just fine). It seems a problem of KDE (or KDE Neon). The theme of the desktop environment doesn't get reported by QIcon::themeName(). And the new QIcon::fallbackThemeName() reports breeze, even if I have breeze-dark activated. This works with other desktop environment, as my current metrics show. Top work! I'll test this as soon as I can. Has the KDE bug been reported do you know? Thank you for reporting and testing!